Dancing Rabbit welcomed the world to tour the village on Saturday, the 21st. All reports were that everyone had a festive time! Howdy from Rabbitland! This is Ben, this week’s town crier, bringing you your first fall update from our neck of the woods, or prairie savannah, as the case may be. We here in the quaint ecovillage of Dancing Rabbit are still reeling from our annual open house event, a day on which folks from near and far gather upon our 280 odd acres to ooh and ahh at mudpie homes and bucket toilets. Some rabbitfolk excel at this type of public spectacle, being able to entertain, enlighten, and inform our friends and neighbors. I myself am not only unfit for polite company, but quite incompetent in the most basic matters of grooming and public speaking, and was thusly relegated to selling duck meat on a stick, for pet food, as the Critter kitchen is not certified, merely certifiable. My sales partner, Althea, who is four, really dropped the ball with her wares, which are Critter Balls, the aforementioned hunks of dirt you may recall from my last posting. All she had to do was wash her face, act cute, and tell folks that she had crafted these sculptures herself out of the finest mud ever seen west of the northern fork of the lower Fabius, but her preference was to laze about on the hammock swing gorging herself on autumn olive fruit. The autumn olives are in fact ripe, making it Autumn. We’ve had great big moons the past few nights, but so have you, therefore I needn’t mention it at all. A mere ten days or so ago we had blistering heat of the type which makes shoeless travel impossible on gravel, and now I wear a hat to bed. It is a season of transition. Our animals need to be moved more frequently, as the grasses are regenerating more slowly. Enter the Springtime of Death, that part of our calendar year in which everything from the sugars in the leaves to the blood in my hands seems to be drawing inward, formulating reserves for the cold darkness ahead. Right now I need to finish my house. It needs, among other things, a door. We need to start making candles. I’m back in my boots and flannel. Soon the minks and weasels will be seeking poultry for their larder, as will I. At night I hear the yip and howl of coyote, but luckily we Critters have one of the finest livestock guardian animals ever bred: the miniature donkey. We can now comfortably say that we run a half-assed operation. For many months I have been thinking of things equine, but being relatively green among such beasts, I endeavored to start small… about 36 inches small. Donkey is a good boy, a three year old, still quite young, and recently gelded. I am not sure if he distinguishes himself from the goats, but one thing is for certain: canines make him nervous. No longer do I need to run out to the paddock at midnight on the occasions when coyotes run loops around the fence, for my trusty steed is there, willing to bully away the potential predators with his mighty bray and fancy footwork. Security is not the only service he provides. Donkey has been enriching our cob and plaster with his dung, composed of finely digested grass. No need to chop straw! I had hoped that he might even stomp some of the cob for us, but in general donkeys do not do work that they aren’t interested in, and I look a little silly wrestling with an animal of his stature. According to the interwebs, the source for all truth, a mini donkey can pull three adults in a cart. Hopefully by the time I have him trained and the cart built, Zimmerman’s Store will install a hitching post. Other signs of the approaching cold haunt me. For weeks the walnuts, hickory nuts, and hazel nuts have been coming ripe. Althea and I gather them in our usual squirrelly manner. The body desires fat. This summer I have poked several holes in my belt; I hope to no longer require them. In the morning our lawn is bedecked in dew and puffball fungi. When I awoke today, I noticed the smoky visage of vapor billowing past my window. Curious, I hopped out of bed and opened the door to my yurt to discover four sheep had escaped their pasture. Each one glistened with dew. We have a billy goat, and he has been perfuming the west slope with the classic fall smell of buck rut. The osage and honey locust leaves are dropping along with their fruit, and the poison ivy is beginning to turn the prettiest shade of crimson. Fully aware as I am that it ain’t over ’til it’s over, and we have a contra dance weekend and another visitor session still ahead of us, I am looking forward to the lazy time of year when I can read books, stare out the window, and finally check my email inbox, peppered as it may be with the occasional obtuse rant. I’ve lived here long enough to know better than to speak for all the rabbitfolk, but this rabbit wants a break. Of course, I’ve slacked off considerably in the past few days, between preparing a gnarly playlist for Tereza’s birthday dance, (I got paid with an organic lamb chop. Bartering is sweet!) doing the whole open house thing, and escaping to Kahoka for the Mule Festival. Still, the buckets of cold, wet mud beckon me. Oh yeah, one more thing. Last Thursday it basically rained knives and forks. We Critters celebrated the end of drought by having an impromptu ceremony that involved heaving strawbales on our pond liner roof in a mad dash to keep it from gliding across the prairie. Some of us became encrusted in mud, some of us stepped on three inch screws, but we all had a wonderful time with this team building exercise. If you haven’t witnessed it before, a natural building work site looks really depressing after a storm, especially when everyone lives in tents. Even our ducks, who are pretty happy go lucky when in comes to inclement weather seemed to hate it. I came here to live the simple life, not to have my worldly possessions whittled away piece by piece from the elements. Still, when all the scrambling was finished, and Caleb finally returned from the piece of roof that he body surfed for fifteen minutes, we had the opportunity to take shelter from the storm in our partially completed strawbale house which we ourselves had built, dining on a rather primitive but nonetheless satisfying dinner we had grown and gathered, and it all felt clear to me why we sometimes choose to toil like this when we live in a world where all our needs can be easily outsourced. No TV, no artificial flavors, no dry socks, who cares? I’m saving the world, and its really fun. Dancing Rabbit is an intentional community and educational non-profit in Rutledge, Missouri, focused on sustainable living. We offer a tour on the second and fourth Saturdays of the month, April through October. The tour starts at 1:00 PM and generally lasts one and a half to two hours. You do not need to make a reservation for regularly scheduled Saturday tours. For directions, call the Dancing Rabbit office at 660-883-5511 or email us at dancingrabbit@ic.org. 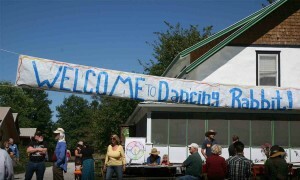 Find out more about us on our website at www.dancingrabbit.org, and on Facebook at www.facebook.com/DancingRabbitEcovillage.